Gooey chocolate, melty caramel, crunchy pecans: Baker, prepare to take a bow as these brownies become the star of the dessert table. Line 13x9-inch pan with foil, with ends of foil extending over sides. Spray foil with cooking spray. Microwave chocolate and butter in large microwaveable bowl on HIGH 2 min. or until butter is melted. Stir until chocolate is completely melted and mixture is well blended. Add sugar and eggs; mix well. Stir in flour until blended. Pour half the batter into prepared pan. Bake 25 min. or until top is firm to the touch. Meanwhile, microwave caramels and cream in medium microwaveable bowl on HIGH 2 min. or until caramels begin to melt; stir until caramels are completely melted and mixture is well blended. Stir in 1 cup nuts. Spread caramel mixture over brownie layer in pan; cover with remaining brownie batter. (Some caramel mixture may peek through.) Sprinkle with remaining nuts. Bake 30 min. or until top is firm to the touch. Cool in pan on wire rack. Use foil handles to remove brownies from pan before cutting to serve. 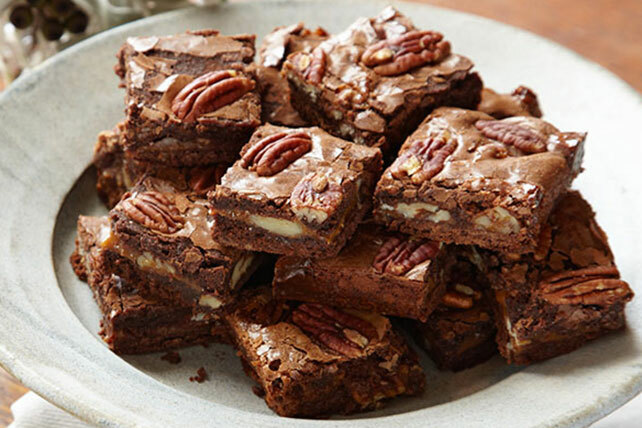 Try our recipe for Easy Caramel Pecan Brownies with our easy-to-use KRAFT Caramel Bits. Since a glass baking dish conducts and retains heat better than a metal pan does, always reduce the oven temperature by 25ºF when baking in a glass baking dish. Toasting nuts gives them more flavor. To toast nuts, spread them in single layer on baking sheet. Bake at 350°F for 12 to 15 min. or until lightly toasted, stirring occasionally. Cool completely before using. Store cut brownies in tightly covered container at room temperature.